Take Current Affairs quiz January 28, 2019 to enhance your General Awareness. Practice with our esteemed Current Affairs quiz January 28, 2019 questions which covers all important events across India as well as World. Make use of all important Current Affairs quiz January 28, 2019 questions with answers updated here, at free of cost to succeed in all competitive Exams and Interviews. Which app did the Defence Ministry launch on 70th Republic Day? Ministry of Defence launched ‘RDP INDIA 2019’ app was launched on the 70th Republic Day. Which Ministry recently approved the mini-hydel project in the eco-sensitive zone (ESZ) of the Cauvery Wildlife Sanctuary? Where is the headquarters of India Meteorological Department located? The headquarters of India Meteorological Department located in New Delhi. Which State has plans to provide provide a mobile app to tackle sewer blockage? Hyderabad Metropolitan Water Supply & Sewerage Board (HMWSSB) has proposed the State government to provide a mobile app to drivers of the mini jetting machines to tackle sewer blockage complaints in a speedy manner and give easy access to the machines. Which Ministry has recently sought the approval of a relief package for farmers grappling with falling prices and to tackle distress in the farm sector? The Union Cabinet is to approve a relief package for farmers grappling with falling prices and to tackle distress in the farm sector. The relief package is seen as an attempt to assuage the farming community’s discontent ahead of the general elections. The Agriculture Ministry has recommended several options to provide both short and long-term solutions to address agrarian distress. Shriyanka Sadangi, who was recently on news, is associated with ________. Shriyanka Sadangi is an Indian shooter. Shriyanka Sadangi and Akhil Sheoran won gold in the mixed air rifle event in the H&N Cup international shooting championship was held in Munich, Germany. In which of the following airport, the face recongnition technique was successfully tested? GMR group is to introduce face recognition-based terminal entry system in its Rajiv Gandhi International Airport. It has already conducted trials successfully involving its staff members. How much did the Chief Minister Chandrababu Naidu approve for the benefits on Backward Classes (BCs)? Andhra Pradesh's Chief Minister Chandrababu Naidu approved Rs.3,000 crore on the Backward Classes. Who won their maiden women's Big Bash title? Brisbane Heat won their maiden women's Big Bash title. New Zealand cricketer Ewen chatfield retired at the age of 68. Which country accounts more than half leprosy cases globally: WHO ? India country accounts more than half leprosy cases globally: WHO. Shri Nitin Gadkari inaugurated Atal Setu in Goa. Operation Olympics Commences in --------? Operation Olympics Commences in Kerala. Which state launched employment scheme Yuva Swabhiman Yojana for urban youth? Nari-Shakti is the Hindi Word of the year in the oxford dictonaries for 2018. Are you looking for right place to enhance your Knowledge on Current Affairs of 28th January 2019 through effective Quiz section? 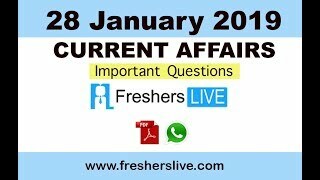 FreshersLive grants you the advantageous Current Affairs Quiz questions with accurate answers for 28th January 2019 which covers all the important events, supreme Awards, major occurrences in the National as well as World level. All important Current Affairs Quiz questions of 28th January 2019 are updated instantly in this page. Everyday at least 25+ Current Affairs Quiz Questions are displayed in this FreshersLive page. Correct Answer for each quiz question is given at the end of the entire 28th January 2019 Current Affairs Quiz questions section. You can estimate and upgrade your GK by attending these useful quiz questions. Entire quiz questions of 28th January 2019 Current Affairs covers Competitive Exam as well as Interview point of essentially important topics like International News, National News (ie. Indian Affairs), Science & Technology News, Environmental News, Bills & Acts Passed by Government, Defence News, About important Persons, Places, Banking & Economical News, Awards & Honours, Sports News, Revolutionary Updates on Arts & Culture, Obituary, Summits & Conference, Important Committee, Schemes, Appointments, Important Days & its Theme for Current as well as upcoming Year, Books & Its Authors, Agreements & MoUs, Budget, Taxes, Various Important Lists & Indexes, Visits by World Presidents, Prime Ministers, Political affairs and all Current Events. 28th January 2019 Current Affairs Quiz Questions updated in this page are prepared in the sense to help all aspirants to succeed in various Competitive Exams like UPSC IAS and other Civil Services Examination, Various Bank exams like IBPS PO, IBPS Clerk, SBI PO, SBI Clerk, RRB PO, RRB Assistant, Insurance exams like LIC AAO, UIIC Assistant, Railway Exams, Various Central Government Exams like SSC CGL, SSC CHSL, and more. Attempt all the Current Affairs Quiz Questions of 28th January 2019 and evaluate your score by matching your response with the correct answers mentioned at the end of this quiz questions section. By practising the FreshersLive Current Affairs Quiz Questions on a daily basis, you can surely succeed in the competitive exams as well as the interviews easily. Make use of this ultimate resource to the fullest and quickly achieve your goal!